Led by our inspiring and experienced musical director Debbie, we have grown from strength to strength. Starting with only 15 members we now have a full choir of 50 friendly and welcoming ladies singing in four part harmonies, united by our joy for singing. We enjoy performing up to eight public performances a year, including weddings, festivals, and private functions as well as putting on our own annual concert, raising money for charities close to our hearts. We also enjoy annual excursions to choir events including competitions, workshops and concerts. We aim for the choir to go from strength to strength, maintaining our wonderful community group of people that just love to sing whilst also raising money for so many worthy charities. Immediately prior to launching the Dales Community Pop Choir Debbie worked with Youth Choirs throughout the Richmondshire area. Debbie studied music at Leeds University during the 1990’s where she specialised in Piano, Voice and Composition and has since worked as a community musician, tutor and choir director in The Netherlands and across Yorkshire before settling with her family in the Yorkshire Dales. 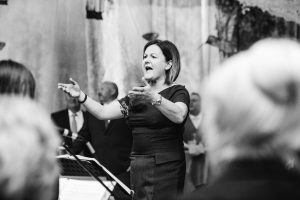 Debbie’s vision for the Dales Community Pop Choir is for it to be a joyous and inclusive Choir, that sets itself very high standards of learning and performing Pop and Show music that can be enjoyed by all.